We figured since the first 10 shocking truths got so much attention, here’s another 10 that we’re sure you're going to like just as well. 2. Cuenca is a beautiful city and so are several cities in Mexico and Dominican Republic and the Caribbean. All places we have been to ourselves. How can best place to retire on a budget keep changing? And how long does it take now for those changes to overwhelm a newly talked about foreign place? The point is, don’t just check out Cuenca and think that is where you want to retire just because it’s being pumped right now; check out other countries and cities too because you will most-likely find that there are many places in the world that would be just as beautiful and inexpensive to move to. 3. Rental prices (really) have doubled in price in Cuenca. In 2011 you could rent a 3/2 unfurnished for $300 and now it is $600 to $700? Is that double or not? We’ll let your math be the judge. It was as far back as 2013 when we stopped seeing houses as nice as ours for $250 per month. Value is gone in the $250 price range. You can still find $250 dollar a month houses but they are not like this one. Our house (now) would easily rent for $600 or more as it is all on one level, no stairs, has a yard, view, by the river, near to buses, etc. Isn’t that what the gringos all want? Unusually high demand drives up prices. And where is that demand coming from? 4. 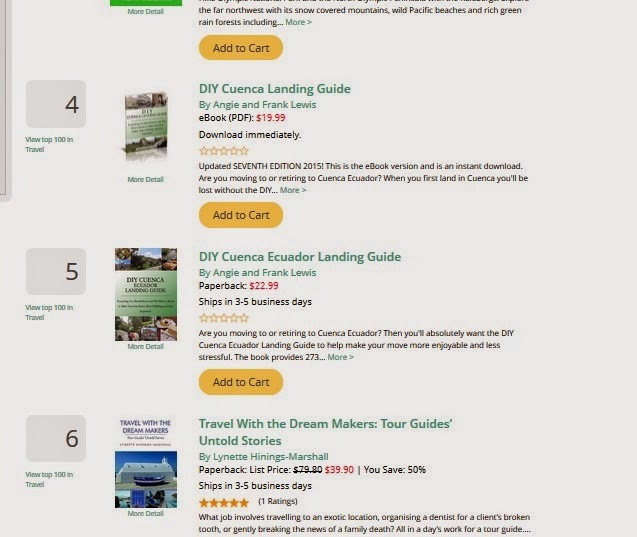 Our book, the DIY Cuenca Landing Guide (after 3 years) is still consistently in the top 10 (only occasionally does it fall out of the top ten spot) on Lulu for travel category. This tells us that a lot of gringos are thinking of moving to and are retiring to Cuenca, and they know a good book when they hear and read about it. Today as I post this (March 17, 2015) both of our Cuenca guides are in the 4th and 5th position on Lulu for travel! 5. IL conferences now, according to a Ecuador forum post user, inform folks to go local and become a part of the new country’s culture by bargaining, negotiating and integrating into other areas of the local customs!! The new trend with the travel abroad promoters is telling folks to go local! Then they can receive those shockingly CHEAP prices they tout. Why would such a popular magazine after 40 years change their tune all of a sudden? 6. We were called the whiners back in 2011 when we described the Internet being really slow and cutting out throughout the day. And now when the Internet is somewhat better, numerous people who now live here are complaining (or are they whining) about how the Internet stinks in Cuenca. What a shocker! 7. Cuenca gets on average of 150 hours of sunshine per month, according to this weather (climate) website. See screenshot below. It just takes a bit of math figuring to get all the facts. I got Frank to gladly do the math since it is not my forte. Notice in the month of February it only gets 113 hours of sunshine, while in the winter month of July it receives 186 hours of sunshine which would mean about an average of 150 hours of sunshine per month. That’s an average of 5 hours per day out of a 12 or 13 hours of daylight. -- 5/12= 41%. -- So the sun shines 41% of the time, less than half the time. Which means it’s mostly cloudy. So when we said in our last post “10 shocking truths about Cuenca Ecuador” that Cuenca is cloudy most of the year, we were actually spot on. There is no excessiveness here, it is what it is! I guess after you see the facts, any naysayers would be shocked!! 8. Some foreigners are literally stumped that 4000 expats can raise (double) rental prices and do not believe it and need to see proof. I am so fed up with unsubstantiated claims (Gringo urban myths) that 4,000 gringos supposedly drive up prices for everybody in a city of 500,000. How does this make economic sense??? Somebody explain this to me with facts…--- posted by a stumped gringo on a gringo portal. The naysayers put their own foot in their own mouths, as shortly thereafter the gringo press put out the real facts: 12,000 gringo residents in Cuenca, on top of the thousands of returning Ecuadorians and still thousands more coming as tourists every single year. 1. Gringo portals have stated that 7000 Tourists are flocking into Cuenca yearly. If each year Cuenca is receiving a new 7000 batch of tourists as the gringo portals have already stated, then over five years you’re getting a cumulative 35,000 tourists renting tourist apartments and condos. They pay exorbitant prices because they’re only going to be here weeks or a month or three at most. And this is on top of the year round resident gringos, who have “demands” that come here to retire! Cuenca has 12,000 gringo/permanent residents now according to the 'Ministry of foreign Affairs'. And how is it that year in and year out these nay-saying doubters throw around the same number of year round residents that was being touted ten years ago? After many years, they’re still using the same number. Read on. It doesn’t take many gringos who demand what he or she likes, river views, walking to store, no stairs, pets, a yard, etc…when they all ask for similar cookie cutter housing, for landlords and real estate agents to get wind of it and raise prices on their homes that have these amenities!! But all the gringos have these same demands! Now do you see? It’s not that hard or difficult to get. 2. Listen and read what other expats are saying, that have lived here for 3 to 6 years, about rental prices. Are large groups of gringos lying about rental prices doubling, or is it what’s really happening? What or why would a large group of people get from lying about something like this anyway? Please see our video "What's it Like Living in a Tourist City Like Cuenca". 3. In 2011 a taxi driver told us not to pay more than $250 to $300 dollars for a 3/3 house. Should we not believe the local who has lived here all his life, or should we believe the stumped gringo(s) who only just moved here 6-months ago? 4 years later: Look online, look in the paper, ask around and you’ll soon discover that the $250 house has vanished. Now the new price for a decent house (same value as the $250 house) is between $450 to $700 dollars rental price. You can get a whole lot of house in a lot of parts of the world for that. See Cuenca Ecuador Rental Market Compared to 8 others Countries. According to Numbeo the cost of renting in July 2014 was showing 50% higher than Medellin. Now, 8 months later it is showing a 72% higher rental market than Medellin. And this is according to 46 renters who live in Medellin and 46 renters who live in Cuenca. Who better to talk about rental prices than the renters themselves!!!? The facts are everywhere, but some gringos show perplexity and wonder how just a few thousand gringos can raise prices that they don’t believe it. A doubting Thomas will never believe until something happens to them to show otherwise. Just because Thomas doubted, did not change the fact that his Lord was standing right in front of him. 5. Returning Ecuadorians (with money to spend) are descending upon Cuenca in the thousands. These wealthy Ecuadorians have been living in the u.s for more than half their lives, working and saving, and now many of them are returning to their homeland of Cuenca. Many of them live in gringolandia because they are gringos. They call themselves that. Okay, now that you know some of the facts, let’s do some more considering. When we reverse the process, or let’s say, put our self in the landlord / agents shoes, we just need to ask ourselves this: If all the gringos and all the returning Ecuadorians went back to the u.s tomorrow, who would the landlords rent their $600 and $700 houses and apartments to? The majority of (Cuenca) Ecuador are wage earners and small mom and pop business owners. Are they going to rent a house in Cuenca for $600? No, they probably are not going to rent anything over $300 dollars unless one of the earners in the home is a doctor, lawyer, professor; you know, a wealthier Ecuadorian. Are the majority of renters in Cuenca, doctors, lawyers, and large business owners, or are they wage earners and small mom and pop business owners? CIA world fact book says the latter. So then we must ask the question again, who is going to rent all of the houses and apartments that were typically priced at the local rental rate of $250 to $300 back in 2011 that are now typically $500 and $700? Still stump ed? It is not rocket science. Many times because of unbelief for one reason or another, we just have to step outside of ourselves to see something, you know, “get it”, even if it is right under our noses. 9. Cuenca can be dry! Yes, it seldom rains in Cuenca and when it does it sprinkles and then stops. It appears as if Cuenca gets more rain than it actually does because it is cloudy much of the time. But there are many days when we have to water our gardens because it hasn’t rained for days. Sometimes weeks. We actually compared weather reports just so we would know, and many states in the u.s south get more rain than Cuenca. Just thought you might find this shocking, er um, I mean interesting. The rainer months in Cuenca are February, March, and April, which is now and it has been raining a lot more lately. 10. Oh and um, there’s still only 4000 year round resident gringos in Cuenca, and in ten more years, there will still be only 4000 year round resident gringos in Cuenca Ecuador! LOL! This is truly an indictment of the public school system in the U.S.A. The residents of this country (USA) are just as clueless when at home as they are when they travel. Number 10 will stick in their minds as the only "fact" worth remembering. We are doomed!